It’s customary for Americans to mock the French, but honesty compels us to admit that our continental cousins do a lot of things well. Fine wine, for example, and gourmet cuisine and sixteenth-century theological reformations. Let me add something else to the list -- slim volumes of literary-minded noir. 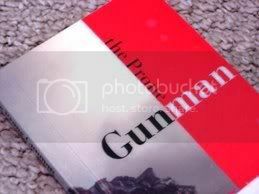 Consider Jean-Patrick Manchette’s The Prone Gunman to be Exhibit A.
Manchette's spare style is both his greatest asset and liability. He writes like Hemmingway, penning short, observational sentences that preclude you for his characters’ thoughts. This makes for some disjointed jumps in point of view and a few confusing passages where one must decipher the emotional import of Terrier’s mannerisms. But instead of turning to overly expository dialogue to communicate feeling, he uses another technique -- repetition. Simple, off-hand observations -- the course of a cold winter wind, a recipe for a mixed drink, a description of abstract art hanging in a condo -- crop up again and again, gradually accreting significance. You see this best in the final chapter. Though it’s an almost word-for-word reiteration of the introduction, Manchette turns it just so, makes all the pieces come together and slams you in the chest with it like a sledgehammer. It's an impressive feat, but also unsatisfying. Downbeat dénouements have their place, but the strong shot of fatalism Machette added to Terrier’s violent escapades spoils the mix for me. Of course, I am American and therefore essentially optimistic, a characteristic the French have never minded mocking. Hat tip to Peter Rozovsky at Detectives Beyond Borders for bringing Manchette to my attention.